Any interest that is accrued on a business loan but not physically paid by June 30 may be deductible in that year. If you fund some business activities through your personal credit card or a personal loan, the interest on borrowings may qualify to be claimed as a deduction. If your stock level changes by more than $5,000, you must take into account the change in value of your trading stock when you work out your taxable income for the year. If the value of the trading stock is higher at the end of the year than at the beginning, then the rise counts as part of your assessable income. But if your stock is worth less (or worthless), that decrease is an allowable deduction. Bad debts can be claimed as a tax deduction. Also, if you calculate your GST on an accrual basis, don’t forget to claim a refund for the GST you paid to the Tax Office when you issued the original invoice on your June BAS. If the debt is settled later, record this as assessable income in the period it is paid. Consider whether you are sitting on a CGT gain for the current financial year or you have prior year CGT losses carried forward, and look at offsetting these gains or losses. If your business is due to sell some assets that will realise a capital loss, try to crystallise these losses before June 30. Losses can be offset against taxable capital gains that you may make on selling other assets. If however the sale will produce a capital gain, delay crystallising this gain until the 2015-16 income year so that you will have a full fiscal year to get an offset that gain. 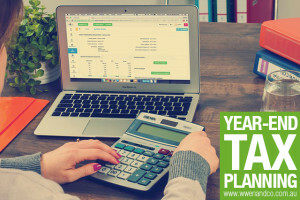 Many businesses are entitled to claim a tax deduction for an expense in the year in which the business has committed to the liability regardless on whether it is actually been paid. If you have committed to pay employees end-of-year bonuses and followed the appropriate steps, the accrued expense can be claimed as a tax deduction even though it is physically paid next financial year. A company can also claim director bonuses in the year the expense is accrued in the same way. Small businesses can get an immediate tax write off for any asset costing up to $20,000. This applies for assets acquired from Budget night (i.e. 7:30pm AEST, 12 May 2015). For example, if your business bought a business asset worth $4,000 post budget night, the business could be eligible to claim an immediate tax deduction. Please note: Any assets bought and used before June 30 can be included as a write-off in this year’s tax return. The $20,000 instant asset write-off in this year’s budget also applies to cars. Under the rules, a $14,000 car can attract a deduction on that whole amount. Please note: It starts from Budget night and finishes on June 30, 2017, so you’ll have some time to consider your options. claim them in the current financial year. If you know that your investment property needs some repairs, some gutter clean up or some tree lopping, for example, see if you can bring the maintenance and (deductible) payments into the 2014-15 year. If you have some spare cash, then see if you can negotiate with your finance provider to pay interest on borrowings upfront for the investment property or margin loan on shares (or other loan types), and allow a deduction this year. Most taxpayers can claim a deduction for up to 12 months ahead. But make sure your lender has allocated funds secured against your property correctly, as a tax deduction is generally only allowed against the finance costs incurred for the purpose of earning assessable income from investments. Be aware that a deduction may not be available on funds you redraw from a loan of this type that is put to other purposes. Also, a component of the National Rental Affordability Scheme payment is not assessable income and therefore the deduction on these properties may need to be apportioned. Ask us if you want to know more. Try to bring forward any other deductions (like the interest payments mentioned above) into the 2014-15 year. If you have planned that next year you will be earning less due to maternity leave or going part-time, for example, then you will be better of bringing forward any deductible expenses into the current year. Please note: An exception will arise if you expect to earn more next financial year. In that case it may be to your advantage to delay any tax-deductible payments until next financial year, when the financial benefit of deductions could be greater. You can claim up to $300 of work-related expenses without receipts, provided the claims are reasonable for outgoings related to earning assessable income. The maximum non-concessional (after-tax) contribution is $180,000 for 2014-15 financial year. Consider salary sacrificing if you are likely to receive a bonus before year-end, you can always salary sacrifice it into superannuation rather than receiving it as cash to take advantage of the 15% concessional tax rate. However, don’t forget about excess contributions tax risks. Since June 30, 2012, employment termination payments can’t be directed to superannuation as directed termination payments. All employment termination payments are now treated as personal contributions, and therefore may count toward your non-concessional cap for the year. If you satisfy super’s “10% rule”, you may be eligible to claim a deduction for your personal super contributions. A deduction could be used to possibly offset a capital gain from the sale of one or more assets. Personal deductible contributions are subject to the general concessional contributions cap. From July 1, 2014 a higher $35,000 cap also applies for people 50 and over. Individuals over 65 will also need to meet the “gainful employment test”. Purchase life and total and permanent disability insurance via your SMSF to benefit from the general 15% tax concessions. Make sure you have drawn down the required minimums by June 30, or the investment income derived from the assets supporting that pension may no longer be exempt from tax. If you’re almost 60 and want to cash out some of your super, consider waiting until over 60 to minimise potential lump sum tax.